Summer harvest time at Morning Glory Farm. Cutting ties with the federal government has liberated the Vineyard’s free summer lunch program, which begins its second season July 9. “The federal Summer Food Service Program is a great and important program to help make sure there is food available for low-income children when school’s out of session. It’s also very cumbersome,” said Noli Taylor, community food education director for the nonprofit Island Grown Initiative, which is sponsoring and coordinating the weekday lunch service. Department of Food and Agriculture regulations prohibit anyone over 18 from receiving food through the service, so in 2017 Island elders and parents could only watch while their children ate. Federal rules also limited the service to a handful of locations, none up-Island, and required every lunch to include a container of milk — which generally ended up in the trash, Ms. Taylor said. And at the end of the season, the government reimbursements fell short of the program’s actual expenses, she added. 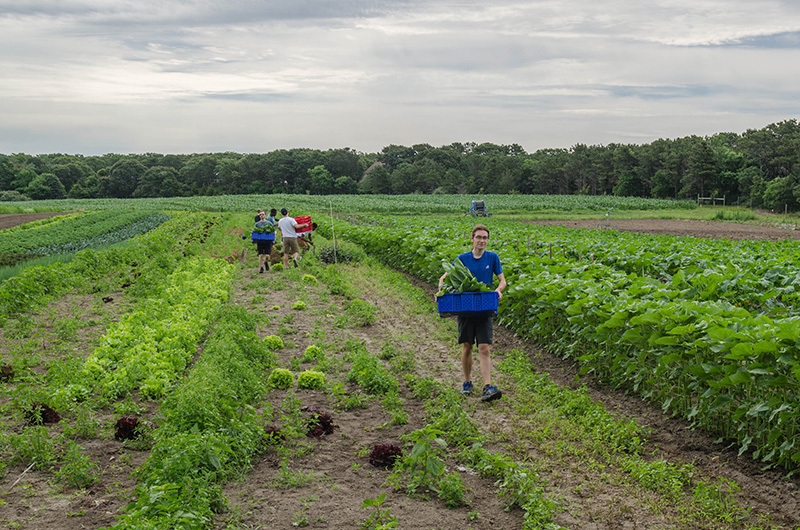 This year the Vineyard lunch is open to all ages, and rotates among three Island locations: the Family Center in Vineyard Haven and the public libraries in Oak Bluffs and West Tisbury. Two additional sites, the Tisbury School and Martha’s Vineyard Boys and Girls Club, will offer lunch daily to more than 100 children enrolled in programs there. “We were able to find a private donor who offered three-year funding to underwrite the bulk of the expenses for the program,” with additional support from the United Way of Cape Cod and the Islands and the Couch Family Foundation, Ms. Taylor said. Jean Zdankowski, who cooks at the Oak Bluffs School, has signed on as chef. Her menus, posted on the Island Grown website igimv.org, offer plenty of variety — rice and beans with chicken thighs, a Mediterranean plate and a vegetable-cheese quiche are among the daily entrées — and each meal always includes fresh fruit or vegetables. There will also be daily a la carte offerings with more fresh produce, hummus, sunbutter, dressings, breads and crackers. Water infused with mint and lemon will replace the milk that most children didn’t drink last year. The meals will be prepared in the culinary arts kitchen at the Martha’s Vineyard Regional High School. “The high school is donating the use of this space to us and we are grateful,” Ms. Taylor said. Volunteers will staff the lunches and assist Ms. Zdankowski in the kitchen. The original impetus for an Island summer lunch program, Ms. Taylor said, was to bridge the nutrition gulf that opens for low-income children at the end of the school year. “We’ve gone from 12 per cent of children in free and reduced lunch programs when we started Island Grown Schools [in 2007] to, last year, 35 per cent and this year it’s more than 40 per cent. A number of our schools are more than 50 per cent,” Ms. Taylor said. “So we knew we needed to find a way to help offer food to kids when school is out. Then through our work with the Food Equity Network we realized that there are elders who also need food, and a chance to socialize,” she continued. Lunch will be served at the Family Center in Vineyard Haven Monday and Wednesday from 11:30 to 12:30 p.m., with educational children’s activities available as well. The West Tisbury Library hosts lunch Tuesday and Thursday from noon to 1 p.m. and the Oak Bluffs Library is the lunch site on Wednesdays and Fridays, also from noon to 1 p.m. Menus are posted at igimv.org.